Thomasville Toyota is proud to provide our customers a Four Year No Cost Maintenance Program on every new Toyota we sell. This is a four year maintenance program that provides 2 years of ToyotaCare maintenance and 2 years of ToyoGuard Platinum at no cost. That’s an extra year of no cost factory recommended maintenance on your Toyota car, truck, van, or SUV. That means you’ve got four years to look forward to of not paying one penny for regularly scheduled factory maintenance. Our paired program is the best way to ensure you maximize your Toyota ownership experience when you get a new Toyota from our Thomasville, GA auto dealership. If you would like more details on the ToyotaCare Plus program or ToyoGuard Platinum, just contact us online or visit our dealership located at 14724 US 19 South, Thomasville, GA 31757. ToyotaCare Plus also features 24 hour roadside assistance which will allow you to take trips in and around Thomasville, Valdosta and Tallahassee with confidence. This no cost maintenance plan is available on all new Toyota models including Camry, Corolla, RAV4, Prius, and Tundra. With this program, you will incur zero out of pocket cost on regularly scheduled maintenance items when you bring your Toyota to our Thomasville, GA service department. What Do You Get with the ToyoGuard Platinum Program? 2 Synthetic Oil Changes, including Oil Filter Changes or 4 Non-Synthetic Oil Changes if your vehicle requires non-synthetic oil. Don’t settle for less when it comes to your new Car. 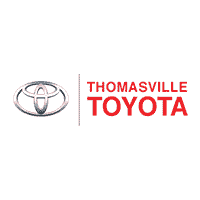 If you are in the market for a new vehicle, visit Thomasville Toyota today. We value each of our customers and want to put you in the right vehicle for the best possible price. More importantly, we want you to drive away with peace of mind. That’s why our dealership gives you the added bonus of our Four Year No Cost Maintenance Program. Our Service department will continue to provide you the same great care so you are guaranteed to love your Toyota longer. 4 Years No Cost Maintenance – four year no-cost scheduled maintenance on every new vehicle – Customer may choose to waive ToyotaCare Plus maintenance during the negotiation process. 4 Toyoguard® Tire Rotations. In addition to the ToyotaCare® scheduled maintenance, you will receive 4 tire rotations. Must be redeemed within 10 years of original purchase. 5 Toyoguard® Paint Sealant is designed to help prevent premature deterioration caused by harsh weather and salt air. Warranted for 3 years or 36,000 miles, whichever shall occur first. See Toyoguard® Limited Warranty in vehicle’s glove box. 6 Toyoguard® Rental Car Assistance will be provided if you have a warrantable concern requiring a part to be ordered or over-night repairs, if rental car assistance is not provided by Toyota. The Rental Car Assistance Plan is for the first 5 years or 60,000 miles, whichever first occurs. Limited to a one day rental for each qualifying repair, maximum 5 rentals per plan period. Limited to $35 per day.